I find myself in a unique position on this fine Caturday. I have written about all of the extant recognized wild cat species (36 in total). I could write about some more of the subspecies, but I'd largely be repeating myself. So today, at least, I've chosen to focus on a species of cat I'm glad I'm not sharing the planet with anymore, as amazing as it would be to see it alive. Smilodon is often called the saber-toothed cat or (incorrectly) the saber-toothed tiger, which was found in the Americas during the Pleistocene epoch (approximately 10,000 years ago). It's an extinct genus of the sub-family Machairodontinae. The common name of "saber-tooth" of course refers to those giant motherfucking maxillary canines (11 inches!). The reason that "saber-toothed tiger" is a misnomer is because Smilodon is not closely related to tigers at all - Tigers are descended from the sub-family Pantherinae. So if you're an insufferable know-it-all, like me, you can now proceed to correct people who don't care. Smilodon populator, which was the species discovered by Lund. It existed between 1 million to 10,000 years ago, was found primarily in the eastern part of South America and was larger than the North American species. Smilodon gracilis, which existed between 2.5 million and 500,000 years ago. It was the oldest and smallest of the Smilodon species. The other Smilodon species probably descended from this one. Smilodon fatalis, which replaced Smilodon gracilis in North America and existed between 1.6 million to 10,000 years ago. It's believed that Smilodon fatalis weighed up to 620 pounds and had a shoulder height of 39 inches. Smilodon californicus and Smilodon floridanus are two species that are sometimes considered to be subspecies of fatalis, and sometimes considered interchangeable names for californicus and floridanus. Smilodon are among the largest felids ever to have existed. 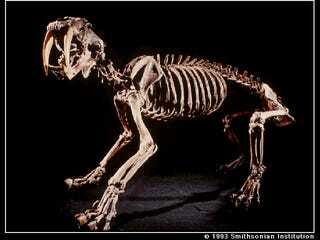 Smilodon populator, the largest of the recognized species, probably weighed about 880 - 1,000 pounds. Their build was comparable to that of the modern bear, in that they were hugely muscular in the shoulders and had shorter hind limbs compared to that of modern cats. Though Smilodon existed at the same time as prehistoric humans, it's likely that its diet consisted of the ancestors of tapirs, camels, deers, bison, and probably extinct ground sloths and juvenile mammoths. A great place to see complete Smilodon skeletons is the Natural History Museum of Los Angeles County, as many of the cats were trapped and preserved in the La Brea Tar Pits.